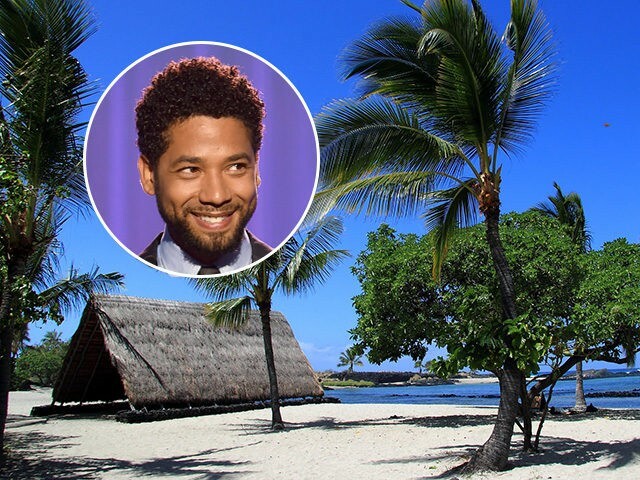 Empire actor Jussie Smollett looked carefree while vacationing with family in Hawaii Wednesday after rebuffing demands from Chicago officials to repay the investigation costs into his alleged hate hoax. According to the Daily Mail, Smollett was seen cracking jokes and munching on snacks as he helped unload bags from his sister Jazz’s SUV at the Kaloko-Honokōhau National Historical Park in Kailua on the Big Island. The 36-year-old performer carried his niece’s unicorn backpack as Jazz removed boogie boards from her car. At one point, he was spotted taking a photo call and sending text messages from the parking lot area. Reports of Smollett hanging in Hawaii come one week after Chicago announced it will file a civil lawsuit against Smollett for refusing to repay roughly $130,000 that the Chicago Police Department spent on probing his purportedly racist and anti-gay attack. Mayor Rahm Emanuel’s law chief sent Smollett a March 28 letter demanding that he pay the amount for overtime worked by detectives and officers in looking into his claims. Last month, Cook County prosecutors dropped all 16 felony counts against Smollett, saying they believed they could prove the charges but that it wasn’t worth the time and expense. The surprise decision angered Emanuel, who called it a “whitewash” and said the city’s reputation “was dragged through the mud” by Smollett.